Matala Wallete with her red djellaba is well known in the camp. 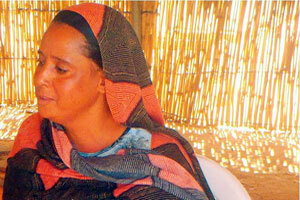 It is the same for Aisha, 20-year-old a young Tuareg. She is still moved by the hospitality she received since her arrival. “At the border even the police welcomed us,” she said. There is unfortunately a far more serious concern for this young man. Ali was in twelfth grade and planned to train as a civil engineering. “I’m concerned about my future. I should have matriculated a year ago, but I have not been in a classroom for over 12 months. Now all seems lost,” he said. “I don’t see the situation changing so soon in Mali, so I won’t be going back, he said. “There is no college or high school in the camp. To continue my education I would need to go to Ouagadougou, which is financially impossible for my family”. Matala Wallete said, “Our main problem is that we fail to find income generating activities. The other is we need to ensure some education of our children as there is only one elementary school in the camp opened by humanitarian agencies”. She works with women as a volunteer for Caritas Burkina, training them on how to save energy.